Visitors can visit this place between 10:00 AM to 6:30 PM. It remains open on all weekdays. Festival days may affect the timings. Approx. 2 hours required to watch all the statues in the museum. Try to avoid visiting in afternoon during summer. Photography Charges: Rs. 200 per person for 8 pictures. Note: Camera not allowed here, You can hire a photographer for you in the museum. The Wax museum of Jaipur was established in the year 2016. The person behind this museum is Mr. Anup Shrivastav. He founded this life-like statue gallery with the help of renowned artist Susanta Ray. Susanta is well-known gold medalist from Indian Art College of Kolkata. Now he is known as a master in wax sculptures in India. There are a number of statues of Indian and Internationally acclaimed prominent personalities. Father of Nation Mahatma Gandhi, Legendary Bollywood actor Amitabh Bachchan, Queen Of Jaipur Maharani Gayatri Devi, Great Scientist Albert Einstine, Noble Award Winner Writer Gurudev Rabindranath Tagore are some of the personalities whose wax statues are showcased in the museum. Apart from the above-mentioned personalities, there is a surprise for kids in the exhibition. Their favorite characters like Spiderman, Doraemon, Nobita and Iron Man’s wax statues make this place special for children. This worth watching experience brings a true pleasure for all age group people. After spending some quick bucks you can tell their professional photographer to capture some awesome clicks for you. These pictures will definitely become embellishment for your home. The second attraction for tourist is “Royal Darbar”. Royal Darbar is the gallery of traditional costumes of royal family members, unique and antique artifacts, decorative paintings, wonderful a royal buggy and life-like interactive statues. Previously it was known as a Vishraamgah, that means rest area. Apart from this, there are many valuable items showcased in this fascinating building. After watching these two attractions you become more curious about the last place. Replica of iconic mirror house or “Palace Of Glass”, “Sheesh Mahal” will definitely fulfill your expectations. Original Sheesh Mahal is situated in the Amer Fort of Jaipur. Sheesh Mahal of this museum is made from 2.5 million glass pieces. This is an absolutely stunning art palace. Around 100 craftsmen had given their efforts and worked hard to construct this marvelous Sheesh Mahal. This mirror palace is an ultimate gallery of Rajasthan’s heritage thikri mirror work. Address: Nahargarh Fort, Jaipur – 302001, Rajasthan. Visit Duration: It takes 2 hours to visit this museum. But if want to see “Sheesh Mahal” also, then you will require around 3 hours to explore all the attractions. 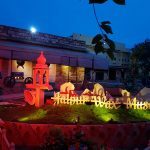 How To Reach Jaipur Wax Museum? By Road: This museum is located in the Nahargarh Fort. The nearest bus stop is Nahargarh Palace. There are frequent buses from Jaipur Bus Stand to Nahargarh palace. You can also use private transport service providers like Uber and OLA to reach here. By Train: Jaipur junction is the nearest railway station from this museum. It is around 6.5 kilometers from Wax Museum. Jaipur is metropolitan city and it is connected with all the major cities of India through train route. By Metro: The nearest metro station is Sindhi camp and it is situated around 4.5 kilometers from this heritage museum. By Air: Jaipur international airport is the nearest airport for the wax museum. The distance between airport and museum is around 14 kilometers. 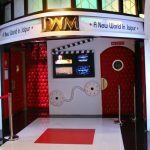 Best Time To Visit Jaipur Wax Museum? October To February is the best season to visit this wonderful place. Try to avoid visiting in the afternoon during summers. Also, take care of your belongings as they have strict rules to maintain their standards. Jantar Mantar: This is one of the oldest observatories present in India. Here you can see the collection of astronomical instruments which constructed around 300 years ago. Hawa Mahal: It is also known as “Palace of Winds” and located around 3 kilometers from the museum. This is the must visit place in Jaipur. Nahargarh Biological Park: This zoological park is popular as “Abode of Tigers”. Wonderful place to spend some quality time with your family and friends. Elephant Safari is the most attractive thing. Birla Mandir: The holy “Lakshmi Narayan” temple is devoted to Lord Vishnu. This beautiful white marble temple is situated in the Tilak Nagar area of Jaipur. Jal Mahal: The romantic place is another tourist attraction in the pink city. It is built in the middle of Mansarovar lake. But you should go here in the evening only. In evening you will get the complete feel of chaupaty.